A while back, I published a post about becoming an Epicure Selections consultant. Since then, I have been busy trying as many Epicure products as possible (and no, I don’t love everything they put out there, but I do love many of their products 🙂 ). Including their silicone bakeware, and I have to admit, I am now completely sold on the Perfect Petites Silicone pan (only $23 Cdn. Lol!). So far, I’ve made both regular and Summer Berry versions of banana bread and these School-safe Granola Bars (a few times each) and it’s been a breeze each time. Clean up hasn’t been tedious and the end product has been a hit with my smalls. 4. If something is a little difficult to remove (I haven’t run into this issue yet), pop the pan in the freezer for about 20 or so minutes. Whatever you’ve baked should pop right out after that. 5. You can pretty much take any quick bread, muffin, cake, cookie recipe and use the Petites pan, just reduce your baking time – if a recipe calls for 30 minutes at 325°C, I start checking after 15 minutes. 1/2 cup mixture of shredded unsweetened coconut, raw & shelled sunflower seeds, raw & shelled pumpkin seeds (I keep this mixture in equal parts in a Mason jar in my pantry for snacking and baking). 2. Mix together the first eight ingredients (left-hand column). Make a well in the centre and add four last ingredients (right-hand column). This is easy to mix by hand (so even I don’t bother firing up the KitchenAid mixer 😉 ). 3. If using the Perfect Petites pan, fill and smooth each cell with your granola mix. It will be a wet and sticky batter. For chewier bars, fill each cell more, for crunchier bars, fill each cell with less batter. Maximum capacity for the pan is 2 tablespoons per cell. If using a 9×13 pan, pour the batter in and smooth out. 4. Bake and start checking or doneness after approximately 15 minutes for the Perfect Petites pan or 30 minutes for a 9×13. The bars are done when the edges start to brown lightly. 5. Remove from oven, let cool in the pan on the rack for around 20 minutes. Less time is needed if you’re using the P.P. pan, those you can pop right out of the pan as soon as they are cool enough to touch. If using a 9×13 pan, let them cool, but remove from the pan and cut into bars before completely cold. This will make cutting them easier. 6. Store in an air-tight container and enjoy! I am in love with this pan – makes more that my regular mini-muffin tin (30 vs. 24) and they are the perfect size for all of us to enjoy a REASONABLE portion of a treat – LOL! 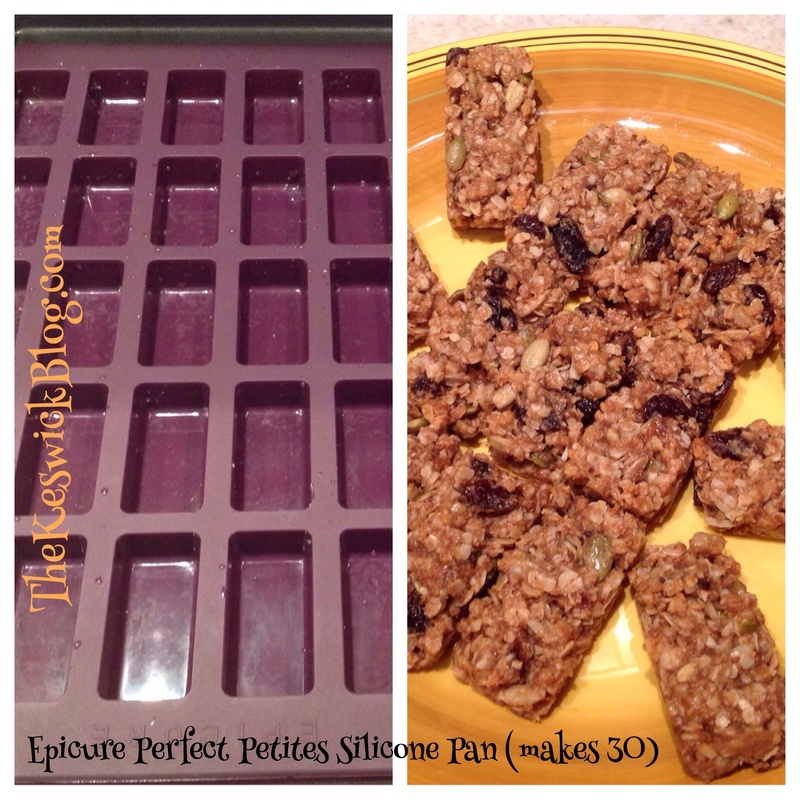 Share the post "School-safe Protein-packed Granola Bar Recipe"